“We recently added a CNC polisher to our fabrication shop. With any new machine, there is a huge learning curve. Jerry spent a couple days with us experimenting and teaching us how to use the right speeds, pressures*, and tools. He added years of experience to our processes in just a matter of days. What we learned in that short amount of time is invaluable to our capabilities going forward. Jerry introduced us to their spring-loaded pad head [PadHead C]. That thing is pretty amazing. It takes a lot of the guess work out of the process and the polish it put on our slabs was top notch. I would definitely recommend them. 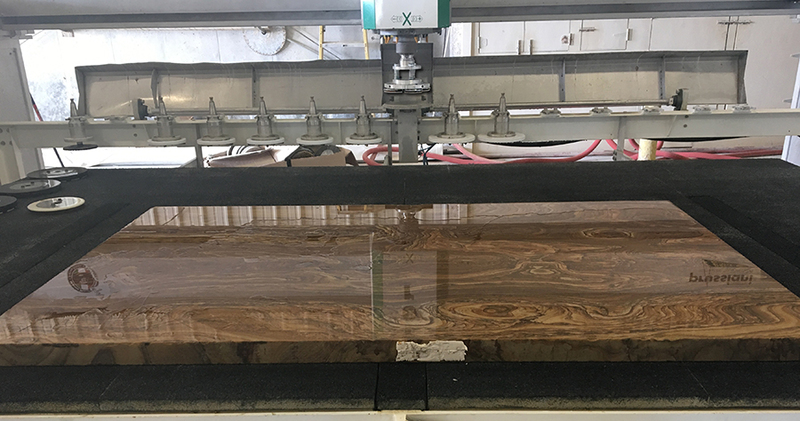 Miles Supply’s PadHead C polishing one of Semco Stone’s exclusive product lines, a slab of Brentwood, a gorgeous natural stone with wood grain pattern. 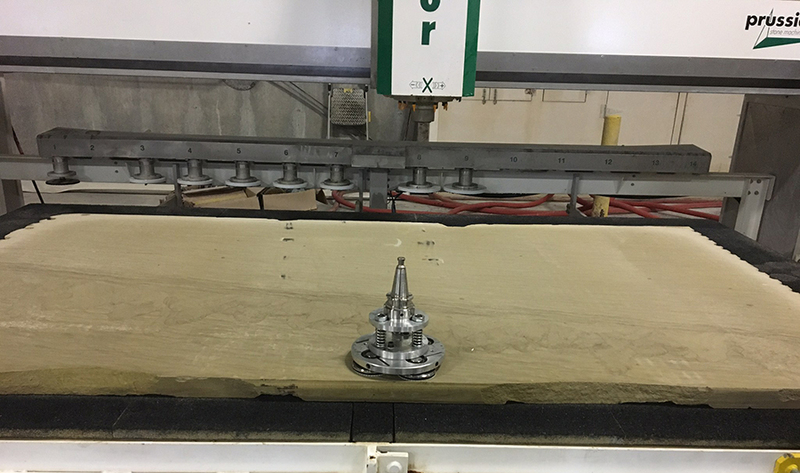 *See a tip from Wayne on CNC PadHead down-pressure. Wayne and Jerry worked to together to determine patterns, pressures, travel speeds on different materials to find what suited them best. Here’s a picture of the high polish on the slab at 1500 grit. Miles Supply is happy when our customers are pleased with our products and especially our service. We agree with what Keith mentions above, good relationships are still important, even in the age of the internet, and are a key part of what we offer at Miles Supply. Call us to talk with our Sales Team who are experts in their fields.